We like Vanellope. That girl has a sassy attitude and she doesn’t let anyone push her around. Taffyta Muttonfudge and Candlehead try to bring her down, but she’s not going to let a couple of haters keep her from doing what she loves. She’s also not afraid to help out her friends when they’re in trouble, just ask Wreck-it Ralph about that! Plus, the girl has a great candy style sense—something not seen in the rest of the Sugar Rush characters (we happen to think Francis Fluggerbutter’s peanut butter cup cap is awful). Well, if you like Vanellope Von Schweetz, then maybe it’s time that you cosplayed as her! It doesn’t require sticking candy in your hair or creating a hoodie made out of licorice. This officially licensed costume from Ralph Breaks the Internet makes it extra easy to cosplay as your favorite Disney character.! 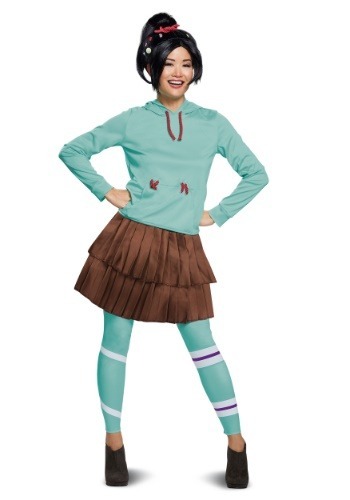 This deluxe Vanellope costume for adults is a great way to dress up like the Sugar Rush princess. The costume comes with everything you need. The hoodie is a pleasant turquoise color and features a pouch pocket in the front. It has faux licorice rope string around the neck for a cute candified look. The skirt fits with an elastic band around the waist and has a brown, pleated design to match the look from the movie. The leggings stretch to fit and have a striped pattern. To finish the entire ensemble off, it comes with a black wig made of synthetic fibers. The wig recreates Vanellope’s look and even features faux candy pieces attached to the hair. When you dress up in this cute costume, you’ll be ready to race… or help Ralph break the internet. Be sure to check out our Wreck-It Ralph costumes to create a cute couples style.